This post describes how to setup a secure production server running Enketo for use with e.g. ODK Aggregate or KoBoCAT on DigitalOcean. It will be updated continuously to use the latest tools and recommended practices. Use the forum to discuss any issues or suggestions for improvement, or if you’d like to expand it with instructions for other hosting providers. Installation is the easy part. Maintaining a reliable server with close to 0% downtime - especially when it becomes popular - is a whole lot harder. This document just provides a good starting point to launch a service, but does not help with running, troubleshooting and continuously updating a server. So before self-installing a production server, be prepared to spend a significant amount of time to run it afterwards. Self-installation for most people is going to be far more expensive than using a public supported service, even if that service is not free. The time required to install and maintain a server and the “cost” of the likely longer periods of downtime will normally outweigh any fee you would pay for a provided service. If cost is the primary argument to self-install, it is probably not the right decision. There are of course lots of good other reasons to run your own server! To authenticate with the server we are going to use a public key, because this is more secure than using (just) a password. Make sure you backup your private and public key combo, so that you do not lose access to your server when your computer breaks down. If you’ve already created a public/private key pair for your computer you can skip this step. Install Window Subsystem for Linux and then follow the instructions in this tutorial. This is not verified. Please confirm that this tutorial works when using Windows Subsystem for linux and let us know. The location of the keys is ~/.ssh. For this tutorial, we are going to use Ubuntu 18.04 on a DigitalOcean server (aka a droplet). DigitalOcean provides the best bang for the buck when looking at CPU speed and CPU cores, both of which are the key criteria for Enketo Express performance. Their user interface is refreshingly well designed too. The tutorial should be quite similar for other VPS providers from section 4 onwards. If you do not have a DigitalOcean account yet, create one using this referral link to get a $10 credit. In the DigitalOcean interface click on Your Settings and go to the security tab. Click on Add SSH Key and cut-and-paste your public key here. Do the same for any other users that will access your server. 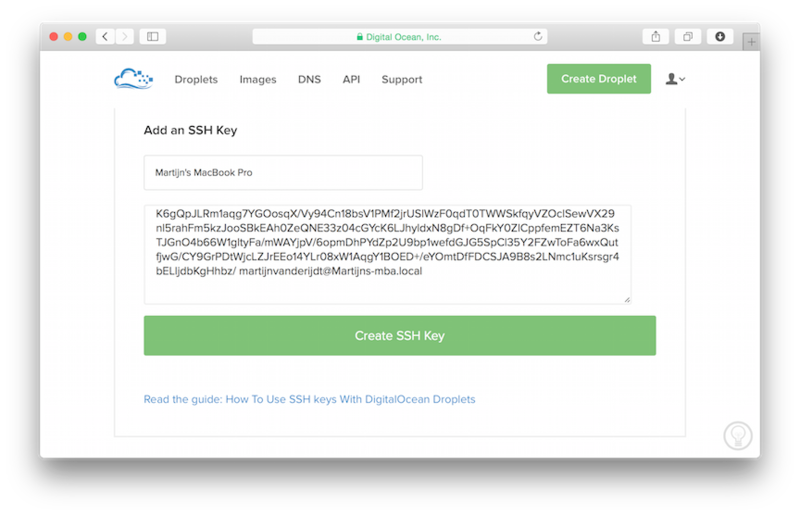 Now, whenever you create a new server in DigitalOcean you can add any of these keys with the click of a button and will have immediate secure access via SSH, without a password! When you buy a new computer you could just move your public and private key pair. If multiple people/computers have (root) access to the server it is helpful to get the public key from all of them before you create your server, though you can also add them to your server later using a different method. Click the Create Droplet button at the top of the screen to create your server. Select a size. The cheapest 2 GB option is recommended to start with, and when traffic becomes meaningful you’ll probably quickly want to upgrade to a 2 vCPU plan because it has 2 CPU cores. Thankfully, upgrading can be done with the click of a button with only about 2-3 minutes downtime. The storage size is irrelevant for Enketo. When you upgrade you will have the (default) option to only upgrade RAM and CPU, or to upgrade storage size as well. It is usually best to choose the first because then you will be able to downgrade again later. You cannot downgrade to a droplet with less storage than you currently have. That’s also why starting with the cheapest droplet with the least amount of storage provides the maximum flexibility as you’ll be able try out different server sizes with little risk and little downtime. And because DigitalOcean bills by the hour, the cost of trying out a different size is minimal too. Select a region that is closest to the geographical center of where your users are located. Select the Ubuntu 18.04 x64 image. Click on the SSH key(s) that may be used to access the server. Click Create and wait until this is finished. Test: In your list of droplets you will now see an IP address that was assigned to your server (e.g. 107.170.165.182). You should now be able to login to this server as root. Login to your server as root via SSH if you haven’t done this already. You will probably never need to login as root again after this, because we are going to create a new user now (and will actually block root access during this process). In these examples we’ll create a user named enketo but you can use any other name. You will be prompted to enter a new password which you will need for configuring and updating your server (ie. for anything requiring sudo privileges). Note: All the terminal snippets below assume you chose enketo as username. To allow this user to login using your private key, we need to copy your public key (already added for root) to your new user account. Install Enketo Express and its dependencies. Warnings during the npm install --production step can normally be ignored. Errors should not be ignored. The response to both tests should be: “PONG”. Note that configuring redis is pretty complex and Enketo’s sample configuration is not a one-size-fits-all solution. The size of the enketo-main database plays a big role in how you want to arrange persistence. If enketo-main becomes too big, you’d probably want to switch to using both rdb and aof persistence. Read more here. It is also possible to use a 3rd-party redis service. "less secure encryption key": "b542sdf32dabdery"
Use Ctrl-X and enter Y to save the configuration. Enketo Express should now be functional. In your browser visit the IP address of the server, and add port 8005. E.g. visit http://107.170.165.182:8005. You should see a page similar to the screenshot below. To make sure Enketo will run automatically upon reboot and will restart itself if it fails, we configure pm2. First stop the server with CTRL-C.
Then wait about 15 seconds and check that Enketo is running by visiting the URL in the browser as in the beginning of this section. Then SSH back into your server. If you have rented a domain name for your Enketo installation, we can configure the webserver. In this example we’ll be using a subdomain, enketo.aidapplications.com, but you can also use the main domain, e.g. aidapplications.com. 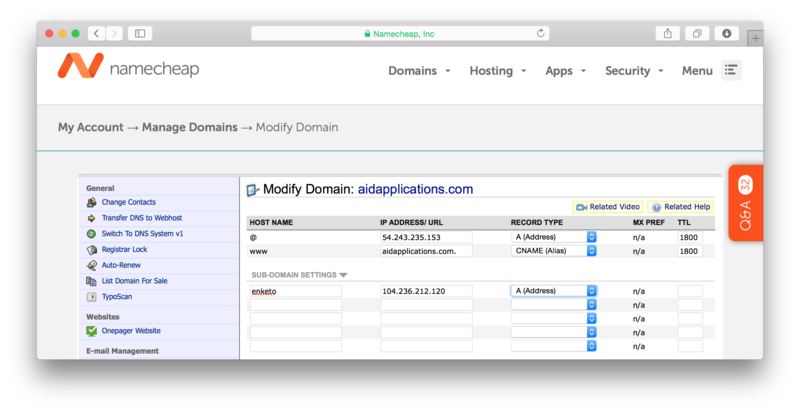 First create a DNS entry for your domain using the tools that your DNS registrar provides. If you haven’t found a DNS registrar yet, you could use NameCheap. Create an A record that points to your IP address. Use the following initial configuration to test whether the domain and webserver are working. Make sure that server_name matches an “A” record you created in DNS and not a CNAME (alias). Save the configuration with Ctrl-X and type Y. 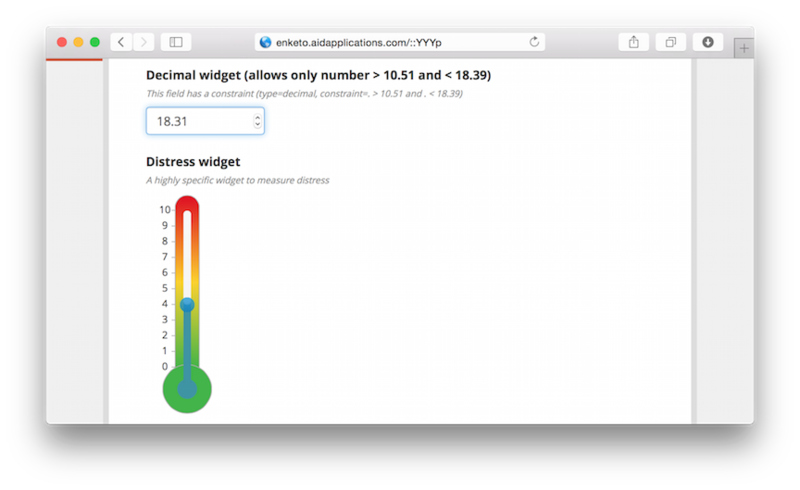 Test: Go to your (sub)domain in the browser (e.g. http://enketo.aidapplications.com). You should be seeing the front page (if the DNS record has propagated already). Nothing in this section is specific to Enketo. 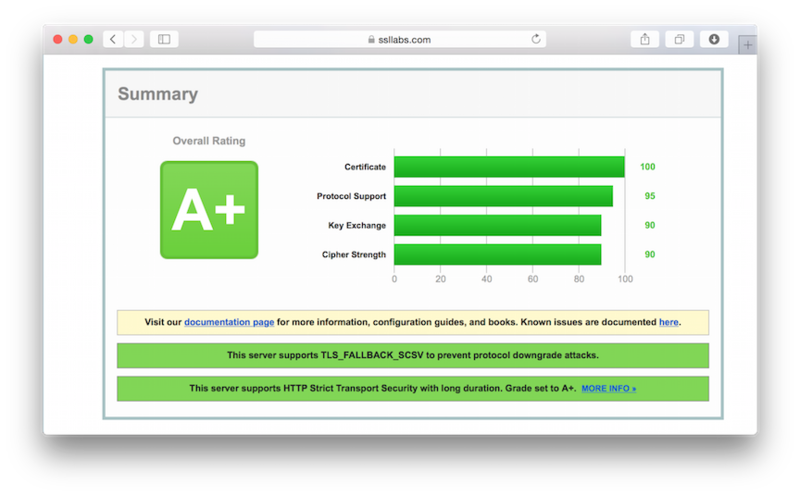 You can also use one of the thousands of SSL-certificate-installation-tutorials on the web. This tutorial will use free Let’s Encrypt certificates using CertBot. This is a very convenient solution as it can be configured to automatically renew the certificate. Choose to redirect traffic to HTTPS, and thereby remove HTTP access. CertBot will automatically update your NGINX configuration and you may want to tweak it further. If you are going to iframe Enketo webforms into other web pages, you need to take out the line with X-Frame-Options DENY or change it. Test: Go to SSLLabs.com to test your SSL configuration. If all is done correctly you should get an A+. You can optionally further tweak fail2ban by editing the configuration (sudo nano /etc/fail2ban/jail.local). Make sure to restart the fail2ban service after editing. Type y when asked to proceed with operation. Test: You should now no longer be able to access enketo in your browser using the server’s IP address and port. A simple and very useful service to monitor uptime is uptimerobot.com. E.g. 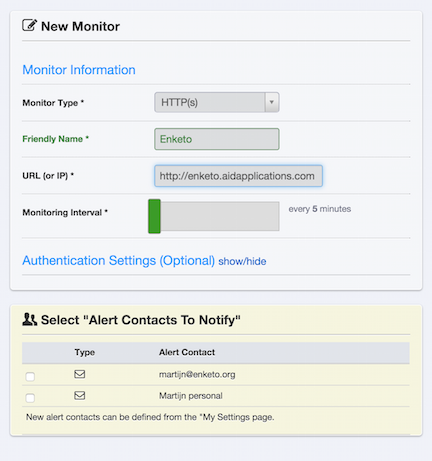 use a HTTP(s) monitor for https://enketo.aidapplications.com that checks every 5 minutes. Specify how you’d like to be alerted when your Enketo server is unresponsive. You can log the unique instanceIDs of each successfully submitted record. This can be useful for troubleshooting your form/data server or Enketo. Once, your Enketo server and its integration with the form server is working, go through each item in this document to further configure your Enketo installation. Start by setting the server url to its proper value and see if the integration still works afterwards. Make sure to rebuild with grunt and pm2 restart enketo after updating your configuration. The API key you set in step 6 of this tutorial in Enketo’s config.json. Do not keep the default value! The API URL. This is the domain your Enketo is available on + /api/v2 or /api/v1, e.g. https://enketo.aidapplications.com/api/v2. Due to the limited integration in ODK Aggregate those users may prefer to use /api/v1 if offline-capable webforms are desired. Ona and KoBoToolbox have very comprehensive Enketo integration (including previews, offline, online-only, single-submission etc) and should therefore use the full-featured /api/v2. ODK Central integration is forthcoming and will use /api/v2. Only two files contain critical information that absolutely should be backed up: the main database and the Enketo configuration file. The database file is located at /var/lib/redis/enketo-main.rdb. Restoring can be done simply by stopping redis (sudo systemctl stop redis-server@enketo-main.service), copying the backup file, and starting redis (sudo systemctl start redis-server@enketo-main.service). (Tip: use scp to copy a file from your computer to the new server). The configuration file is located at ~/enketo-express/config/config.json. Restore this file by copying it and restarting Enketo. Other files to perhaps consider backing up: NGINX configuration, custom scripts, other app configuration files, and the letsencrypt configuration. You may have to remove the file package-lock.json first.